Kindle users who’d rather pick up a comic book than a literary tome will now have 12,000 more options with a new deal between Amazon and Marvel. The e-commerce giant announced a partnership last night that will allow fans to download single issues of the publisher’s comics directly from its store. 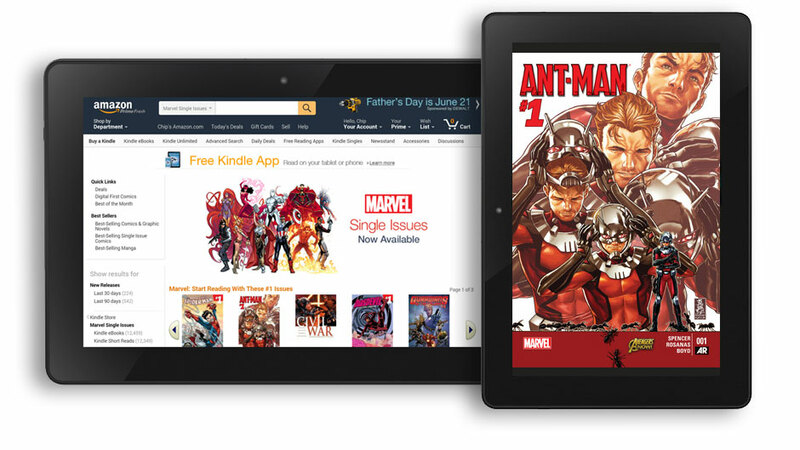 Amazon bought comics download platform comiXology last year, which opened up the Marvel library to users, but customers had to first download the comiXology app to get them. This new deal means readers can get anything from Ant Man to Spider-Man straight from the Amazon store instead, with no separate app required. Issues will be available on the Kindle Store the same day as they hit store shelves and comiXology, though the platform will continue to run its app on both iOS and Android Devices as well as the Marvel Digital Comic Shop. Although the idea of swiping through an e-reader to read a comic book might seem foreign to fans who are used to poring over back issues in the store and flipping through physical pages, Amazon has done pretty well with its digital comic service. The company says the comiXology app was both the number one grossing book app on iOS, and the highest grossing app in the Google Play Store’s comics category in 2015.